thick materials. 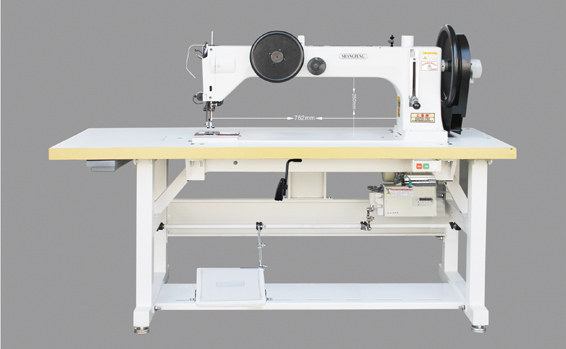 Specially designed machine body has strong rigidity and spacious operation table is able to sewlarge-scale objeots easily. Drivers withlarge inel'tia generate the huge puncture force. Synchronous feeding mode of feed dog and presser is especially suitable for thick and multilayer materials. Even though the material is easy to be slipping and sticky, it is also easy to sew the material by this kind of sewing machine with high proficiency. This machine adopts cam to take-up thread andlarge semi-rotating shuttle to hook thread withless change of bottom thread. lt is an ideal device forsewing safety belt, horse gear, leathersuitcase, buff wheel, tent, sails, bonnet and bookbinding.